They think it’s all over – well it is now! The last 3 days from Madeira to Southampton passed quickly. On Friday evening we were at the Senior Officers Cocktail Party – always a jovial, relaxed occasion, but this time tinged with a little sadness as we realised that the epic journey was coming to an end. The real world was looming. We were lucky enough to have been invited to sit at the Commodore’s table in the Britannia Restaurant for dinner following the party. 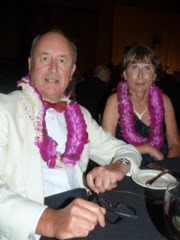 The last formal dinner of the World Voyage. 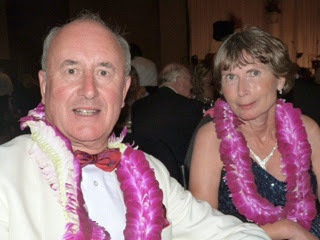 Dinner was hosted by Commodore Christopher Rynd and his Australian wife Julie. The Commodore chooses to seat himself at the side of the table and I was placed at the head of the table. If only I had had a uniform! It was a lovely evening and Jane, sitting alongside the Commodore, behaved immaculately! 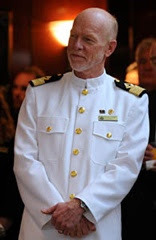 The Commodore is the senior captain of the Cunard fleet. He was appointed in April 2011. He has an interesting background. Born in New Zealand, his father was a vicar with the Mission To Seafarers, and as a result Christopher Rynd was brought up in Singapore, Sri Lanka, Fiji and Samoa. He began his career with the Union Steamship Company (a NZ shipping company). By coincidence my father (an Englishman) started his career at sea with a NZ shipping line – the New Zealand Shipping Company. The Commodore eventually moved to P&O and Princess before joining Cunard in 2005. Initially he commanded QE2 and later took QM2 on her first World Voyage. He clearly enjoys the Queen Victoria. He is a very personable man and happily chats to passengers as he takes his frequent trips around the public areas of the ship. 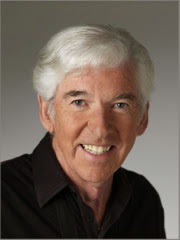 After dinner on Friday we were entertained by veteran comedian Tom O’Connor of British TV fame. He was brilliant and kept a packed theatre highly amused for an hour. When Jane and I set out on this 4 month World Voyage we were not sure whether we would be able to cope with such a long period on a ship. We have both loved it, and are sad to be leaving our second home. Frankly, we could both have done with another couple of months! Would we do it again? Yes we would!